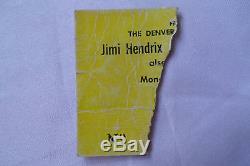 This is a rarely seen JIMI HENDRIX Concert Ticket Stub from February 1 4 th, 196 8 at the Regis College Field House, Den ver Colorado. 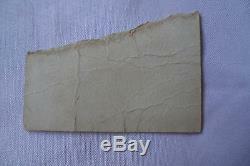 As shown in the photos, this stub is has many light creases but still nice and fairly firm. The han dbill is a copy and for illustration only. T his would be fairly early with The Jimi Hendrix Experience touring, their 2nd album Axis Bold As Love had just dropped December 1st, 1967 and Electric Ladyland would not be released until October. It's hardest to find 1967 or 1968 Hendrix tickets or stubs, as Are You Experienced was not even released until May 12th 1967 and he didn't start touring the USA until his very 1st appearance at the Monterey Festival, June 18th 1967. Jimi would go on to draw bigger crowds and do many more shows in 1969 & 1970. Here you have a rare specimen, a nice find! Photos from that evening: Setlist from that evening (bootleg cd): Couldn't really find a video but here is an amateur recording from that night's performance (40 min show): youtube. Please leave me a good positive comment so that I know you received your item and everything is fine, I will reciprocate. Thank you for shopping at ClaudeUSA. 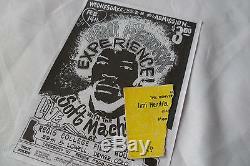 The item "JIMI HENDRIX Original 1968 CONCERT Ticket STUB Regis College, Denver CO" is in sale since Friday, March 07, 2014. This item is in the category "Entertainment Memorabilia\Music Memorabilia\Rock & Pop\Artists H\Hendrix, Jimi\Other Jimi Hendrix Memorabilia". The seller is "claudeusa" and is located in Orlando, Florida. This item can be shipped worldwide.